Limoncello, maybe the most refreshing member in the large family of fruit liqueurs, is made all over southern Italy in hot, coastal climes like Sicily, Sardinia, Capri, and Campania. These areas have held the lemon in particular esteem since antiquity; they were featured prominently in the mosaics of Pompeii. 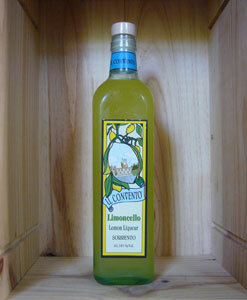 Il Convento makes limoncello on the Sorrentine peninsula in Campania, where the lemons are considered to be superior to other varieties and have been granted Indicazione Geografica Protetta (IGP) status. Which means that the limone de Sorrento IGP is so special that imposter lemons cannot legally claim to be from Sorrento.Real Sorrento lemons are long and oval and the peel is extraordinarily fragrant and flavorful. This makes them ideal for limoncello production, a simple process that begins with the maceration of lemon peel in a neutral spirit like grappa or vodka, and ends with the addition of sugar and water. Il Convento’s limoncello tastes like the essence of lemon, with a burst of bright citrus zest sans the sourness (no juice is used in the production). I’ve enjoyed this liqueur with a piece of dark chocolate cake and the match was excellent; but with the advent of warm weather, I’d recommend drinking it chilled as a post-prandial drink on the porch. Italians are endearingly obsessed with digestion, as evidenced by the typical placement of salad at the end of the meal, rather than the beginning. This obsession also explains the incredible array of digestivi, or digestive liqueurs produced in Italy. Amaro, which means bitter in Italian, is one my favorites (as evidenced by the bottle being only half full in the accompanying photo). Amari are made by macerating herbs, roots, flowers, and bark in some sort of neutral spirit (in this case grappa) and adding varying proportions of sugar syrup to offset the bitterness. Originally created as medicinal tonics, these recipes were born in medieval monasteries soon after the discovery of distillation and were refined to more or less their current form in pharmacies during the nineteenth century. Each producer has a different, often secret, recipe that features some combination of bitter and/or aromatic plants like quinine, rue, juniper, coriander, myrrh, saffron, citrus rind, gentian, angelica, lemon balm, anise, fennel, ginger, mint, thyme, sage, laurel, cinnamon, and cardamom. 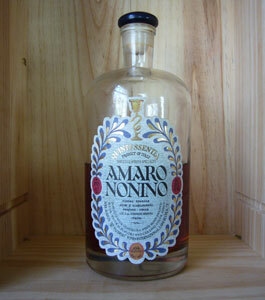 In the United States the best-known brand of amaro is Fernet-Branca and is often used these days as a cocktail ingredient, but in Italy amaro is still viewed as a digestive tonic and is drunk neat after dinner. Many different styles are made, some darker in color with more root and herb influence, others lighter, with more citrus notes. Some are based on primarily on artichoke, rhubarb, or fennel and feature a picture of the star ingredient on the label. Nonino, a grappa producer based in the northeastern state of Friuli, makes amaro in the lighter, citrusy style, and is smoother than some due to five years spent mellowing in small oak casks. It is bitter, but also sweet, and very aromatic. It smells of cola, licorice, orange, cinnamon, and countless other natural, earthy things. In sips from a small cordial glass it is a lovely and soothing way to end a meal.